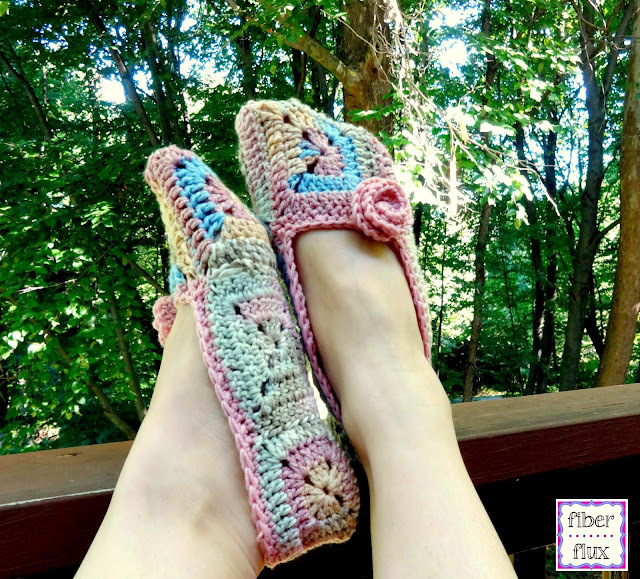 Fiber Flux: Free Crochet Pattern...Soft Blossom Slippers! 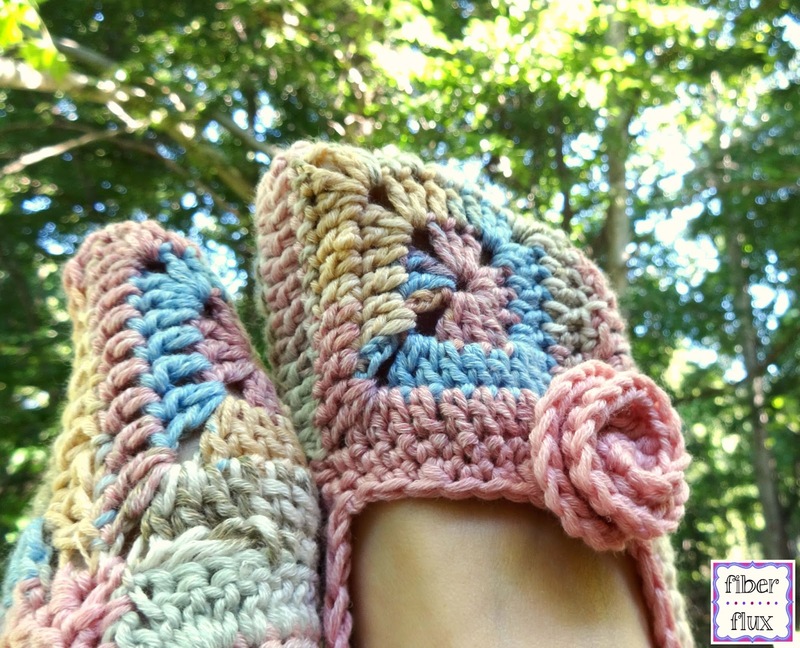 Free Crochet Pattern...Soft Blossom Slippers! I've been asked by several of you for a slipper pattern...so here are the Soft Blossom Slippers! These pretty slippers are comfy, soft, and customizable for anyone's size (more about that in a bit). 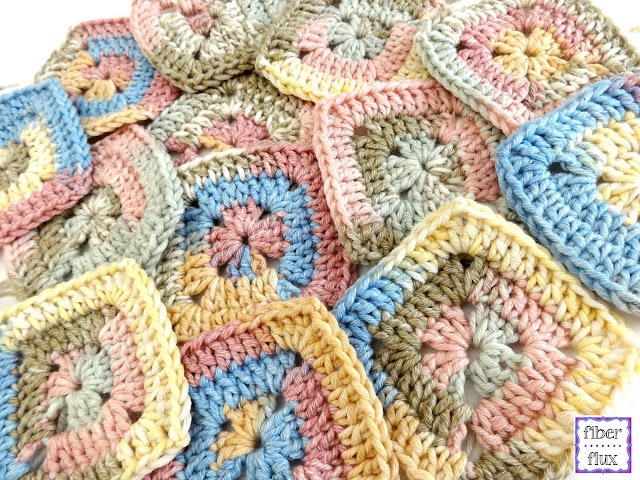 Made with solid granny squares, they are easy to work up too and perfect for lounging about. I used some lovely Italian yarn and finished them off with a delicate rosette. *Note: For yarn substitutions, look for a yarn that recommends a 5.0 mm hook. Cotton dishcloth yarn also works well for this project. Slippers are customizable for any size foot. Measure the underside of the foot from tip of toes to back of heel. Divide that number by 3. This is how big each of your squares will be (height and width the same). For a foot length is 9 inches...divide that by 3...each square will be 3 inches tall and three inches wide. 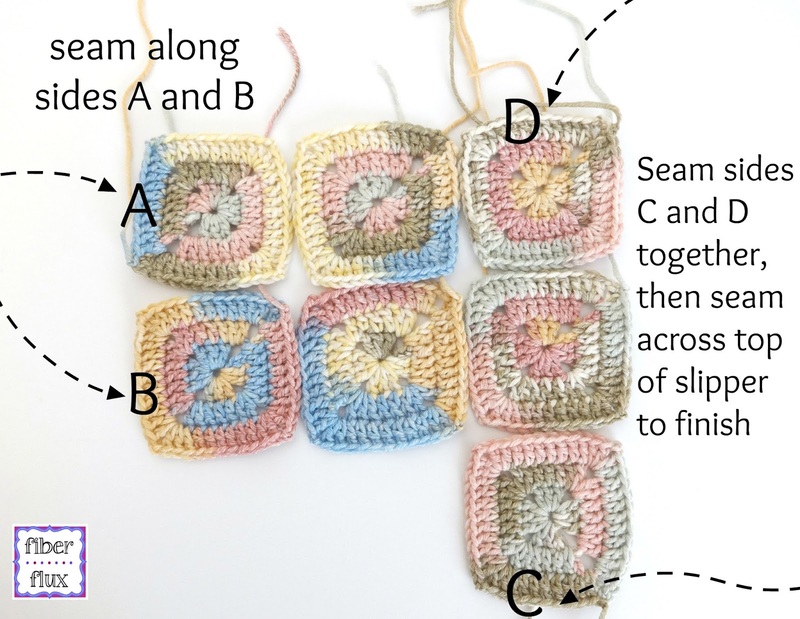 The squares in the slippers shown are worked in three rounds, with a 5.0 mm hook. Depending on foot and square sizing, you may need to work more or less rounds of the square or go up or down a hook size for best fit. They are stretch and give a little too, so account for that as well. To begin you need 7 squares for each slipper (total of 14 squares). First, start by measuring (see "sizing" instructions above). Round 2: Sl st over to the first chain space, ch 5, then work two dc into the center of the ring. Work a dc in each of the next three stitches. To work the corner, work two dc, ch two, then two more dc in the ch 2 space from the previous round. Work the next side the same way, working a dc in the next three stitches, then work the next corner by working 2 dc, ch 2, 2 dc all in the same space. Keep working in this manner all the way around the square. At the corner where the round began, work one more dc in the corner space, Join with a sl st to close. Round 3: Sl st to the first corner and then ch 5, and work 2 dc in the same space. Work a dc in each stitch across the top (there will be seven this time), Work the corner the same way as the previous round (2 dc, ch 2, 2 dc) Keep going in this manner all the way around, working the corners and the sides as before. 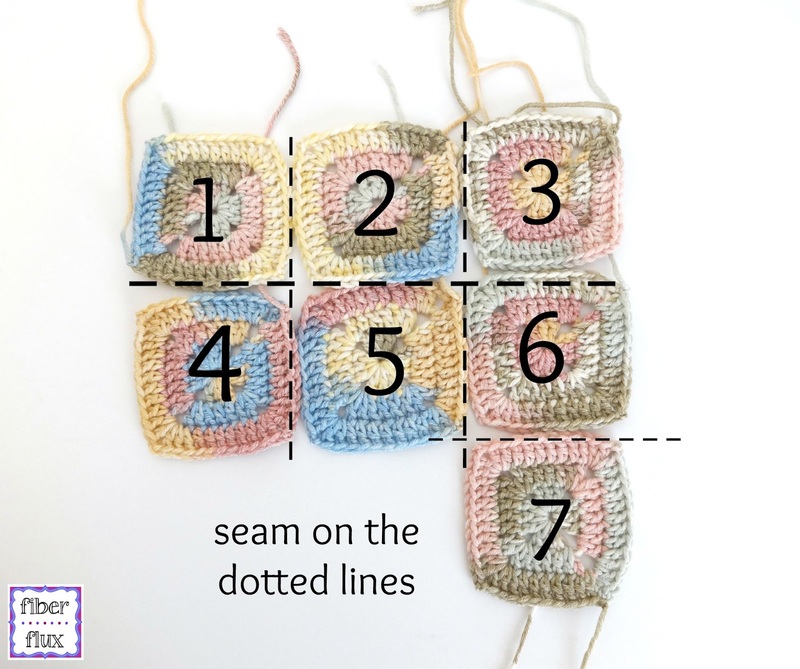 When reaching the last corner, work one more dc, and join with a slip stitch to close. Chain 10, 2 dc in 3rd chain from hook. Work 3 dc in each chain until you reach the end. The flower will coil up on it own as you work. Fasten off, but do not seam yet. Next, seam back of heel by joining sides A and B (see photo below). Then, seam side C to D (see photo below). Finally with slipper turned inside out, seam the top of the slipper closed. Turn right side out and weave in any ends. After slipper is seamed, you can add the edging. Edging round 1: Tie yarn in to any of the stitches around inside of slipper, then ch 1. Work a sc in each st around and join to close round with a sl st. Edging round 2: Ch 1, then *work a sc in the next st. Work a sc in the next st, then work a sc2tog across the next two sts. Continue from * to end of round then join to close round with a sl st. Fasten off and weave in any ends. Sew rose onto each slipper. I placed one rose off to the right side for the right slipper and one off to the left side for the left slipper. However, you can place them in the center, make a cluster, etc. Weave in any ends that remain and repeat for the second slipper. These are nice. I really need new slippers so I'm going to make these out of all the cotton yarn ends I have. Hi! I'm in the process of making these. I've made 5 squares so far. I do have a question... The starting chain space on mine is larger than the other chain spaces. What could I be doing wrong? When I slip stitch to join I slip stitch to the 3rd chain if that helps.